Reviews existing and emerging theoretical frameworks. 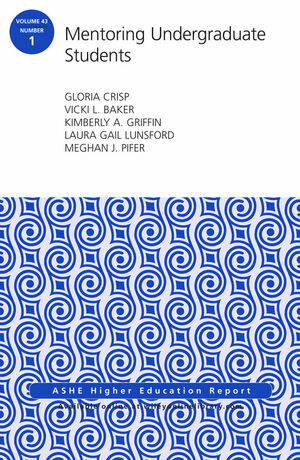 This monograph also identifies empirical and theoretical questions and presents research to better understand the role of mentoring in promoting social justice and equity. Presenting recommendations for developing, implementing and evaluating formal mentoring programs, it concludes with an integrated conceptual framework to explain best-practice conditions and characteristics for these programs. This is the first issue of the 43rd volume of the Jossey-Bass series ASHE Higher Education Report. Each monograph is the definitive analysis of a tough higher education issue, based on thorough research of pertinent literature and institutional experiences. Topics are identified by a national survey. Noted practitioners and scholars are then commissioned to write the reports, with experts providing critical reviews of each manuscript before publication. Gloria Crisp is an associate professor at Oregon State University and coeditor of New Directions for Institutional Research. Vicki L. Baker is a professor of economics and management at Albion College and an instructor of business administration at Pennsylvania State University. Kimberly A. Griffin is an associate professor in the College of Education at the University of Maryland in the Counseling, Higher Education, and Special Education Department. Laura G. Lunsford studies the psychology of mentoring and leader development and has published dozens of articles and books in this field. Meghan J. Pifer is an associate professor of higher education and senior assistant director of the Cadre and Faculty Development Program at the University of Louisville.